The 2019 Kosmic chassis Mercury R, Lynx R and Rookie EV have been officially presented. 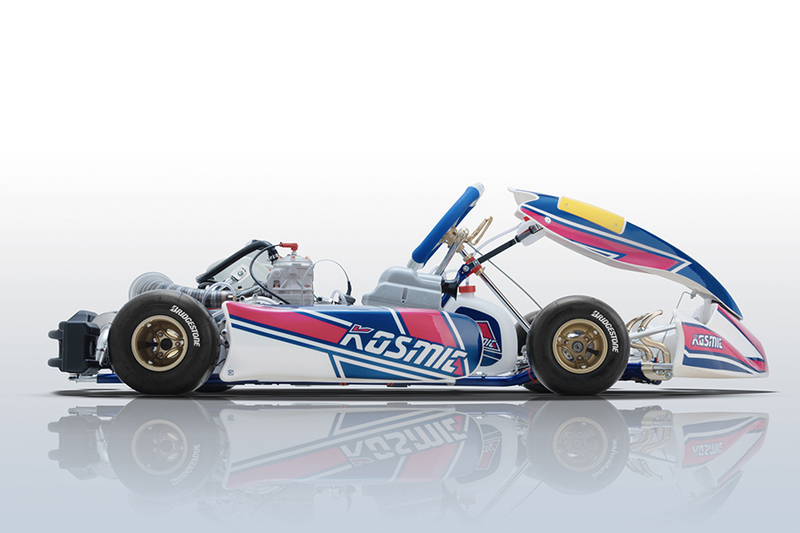 They have new graphics and some innovations concerning the components, new solutions developed in synergy by the Kosmic Kart Racing Depratment and by OTK Kart Group R&D Department. The new 2019 Kosmic chassis have been presented on the occasion of the 2018 World Championships, proving their great value. These prestigious results enrich the palmares of the top model of the Kosmic chassis range: three Asia Pacific, one KF3 World Cup and four World Championships, included the 2018 titles. Mercury R and Lynx R are both available in the direct drive version and in the shifter version. Bare frame geometry is unchanged, main innovations concern the components. The only difference between the two models is the diameter of the tubes: Ø 30 mm for Mercury R and Ø 32 mm for Lynx R.
More changes have been brought to the Rookie, characterized by a new frame and a re-designed brake system. OTK Kart Group R&D Department focused its attention especially on the aerodynamic aspect. Thanks to computer CFD simulations it has been developed the new M7 nassau panel, provided with Mercury R and Lynx R. Its shape is characterized by a unique and revolutionary design, perfectly integrated with M6 bodyworks. The Mercury is the “symbol” of the Kosmic chassis range, even if it is similar to Lynx except for the diameters of the tubes. Besides all the technical characteristics of the OK, on the KZ there is also an optimized bare frame design and the BSS brake system, equipped with self adjusting front brake system with one-piece front calipers with 4 pistons 22 mm Ø. The chassis for the Mini class is completely new, with characteristics similar to the top models of Kosmic Range. The bare frame has new geometry, keeping unchanged the wheel base of 950mm and the tubes diameter of 28mm.